Am back from a slight knitting hiatus due to a housefull of lovely friends from Melbourne. We had to toddler proof the house and soon realised how dangerous some things are. Anyway, we had a wonderful time and did lots of sightseeing and catching up. 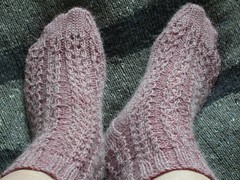 So, I only just got my Socktoberfest socks done but here they are in all their loveliness. Details are in this previous post. I just adore Yahaira’sAtomic River socks. They would be my favourite of the ones I’ve looked at and I hope she wins something for the design. 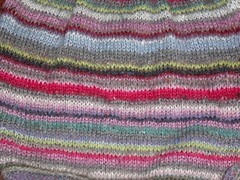 Am about halfway up this sleeve and it’s a good one to knit if you’re not bothered about changing yarn every row. If you’ve not got the patience then this one’s not for you. I was knitting the two sleeves and the back together/at the same time but I got a bit carried away last night watching a film. I found that I had been saving time as I had a particular yarn handy then just carried on for the next two pieces then changed to the next colour. Oh well, rules are there to be broken. AND Joy got her Vintage Swap package safe and sound. I hope mine arrives this week, can’t wait! She’s a fabulous photographer, go and check out some of her work on her blog.